Some folks asked whether the new KDE4-based packages in my KDE5 repository would also apply to KDE 4.14.3. The answer: no they probably won’t, so you better not try what happens. The updated sources that appeared with regular intervals were all part of KDE Applications, and for the past months I only focused on using those for my KDE5 repository. I did not want to forget users of KDE4 however. Therefore I refreshed my KDE 4.14.3 repository today (packages for Slackware-current, not for 14.1) with the latest Long Term Support (LTS) sources that I took from KDE Applications 14.12.3. KDE 4.14.3 was the last release of KDE4. It came with a promise that the developers would provide Long Term Support for this particular release. Which is why I finally took the new sources for kdelibs, kde-workspace, kdepimlibs, kdepim and kdepim-runtime and built these on top of Slackware 4.14.3. These updated packages are available for you as per direct. As a bonus, they are accompanied by the latest Calligra office suite. There are also a couple of changes in the “deps” directory for KDE 4.14.3. You will find two all-new packages: librevenge and libodfgen, and two updates for stock Slackware packages: grantlee and libwpd. The kdepim package needed a newer grantlee, and the other three are required by the new calligra package. The moment KDE 4.14.3 gets officially added to Slackware-current, I will rebuild all of KDE 4.14.3 for Slackware 14.1 so that people with a taste for stability will have something new to chew on too. Posted: 30 March, 2015 in Slackware, Software. built these on top of Slackware 4.14.3 ? that was fast. Thanks! vlc plays fine, but amarok won’t work with any of the backends. Anyone else got the same problem? Amit Ugol, yes I built them on top of KDE 4.14.3 on Slackware-current. What else did you expect when I wrote “I refreshed my KDE 4.14.3 repository today (packages for Slackware-current, not for 14.1) with the latest Long Term Support (LTS) sources that I took from KDE Applications 14.12.3” ? fabio, perhaps Amarok needs to be recompiled. Give that a spin and tell me about your findings. Everytime I reboot the computer and start KDE (startx) KDE says it can’t find the audio card and asked if it should forget all the drivers, which includes the card built into the motherboard and the hdmi card built into the video card. I say, yes, and it starts to use the correct card, that is, the one built into the motherboard. I’ve tried using a /etc/asound.conf file to make sure the system sees the correct card, but that didn’t help, so I deleted the asound.conf and tried a /etc/modprobe.d/alsa-base.conf file, but problem remains. What happens if you rename/remove ~/.kde/share/config/phonondevicesrc cwizardone? Well, the first time I got a blank, black screen and a locked up computer, so I hit the reset button, and the second time KDE started properly. We will see what happens tomorrow. On FreeBSD the solution was to remove phonon-backend-gstreamer and rebuild kde-runtime with “vlc” option enabled. I can confirm that arch linux is not affected (they always use the latest version of everything). if you can look at the thread when you have the time. I was not smart enough to think of a “slackware solution”. Many thanks. A vlc based solution is not possible for Slackware – vlc will not be included. So, perhaps you should stop using amarok and switch to vlc itself? yes. done it already. On Stable switched to Clementine (the slackbuild available at slackbuilds.org won’t build on -current). On current i’m using vlc itself. Thanks. Spoiler request: hey Eric, have you heard if KDE 4.14.3 will officially be included into -current? 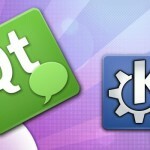 Again tks for all your effort in keeping these excellent KDE builds! KDE 4.14.3 will be added to Slackware-current including the LTS packages. Daniel, no idea. If there are more people with no audio and using phonon-gstreamer backend as opposed to the vlc backend, I would like to know. People using the xine or mplayer backend – can you try switching to the gstreamer backend? The mplayer and xine backends will be removed from Slackware-current once KDE 4.14.3 gets added there. That’s it. Sorry if it’s lengthy. Hi Eric, i’ve a problem to install ffmpeg in my Slackware (after upgrade to slackware64-current 20150421), your libssh kde 4.14.3 deps was not detected by ffmpeg (i’m sure that i’ve installed it), but, when i tried to use the libssh from slackware repository, i could compile and install ffmpeg without any error.